Paradip, famous for its seaport in the east coast of India, is located in Jagatsinghpur District of the state of Orissa at a distance of 98 km from Cuttack and 120 km from State Capital Bhubaneswar. It lies in between 860 15' to 860 45' E longitudes and 200 15' to 200 30' N latitudes and is connected with Cuttack city through the State Highway 12 running through Kujang, Tirol, Raghunathpur and Kandarpur. The National Highway 53 connects Paradip via Chandikhol, Kendrapara and Bhutmundai. A branch line from the East Coast Railway main line, running between Howrah and Chennai, links Cuttack with Paradip over a distance of about 85 kilometers. This linkage, originally opened for transportation of goods has been used for passenger transport service through passenger trains plying daily between Paradip, Cuttack and Bhubaneswar. The Paradip Port is 210 nautical miles south of Kolkata Port, 260 nautical miles north of Vishakhapatnam Port and 598 nautical miles north of Chennai Port. 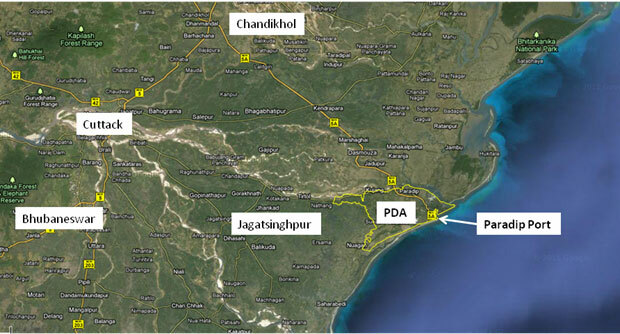 The Authority area is surrounded by river Mahanadi in the north, Ersama and Tirtol CD Blocks in the south and the south-west and by the Bay of Bengal in the east direction.